The genesis of the Field Day in 1982 was through the Mid North Small Seed Growers Association and the Department of Agriculture joining forces to organise a demonstration site at Kevin Jaeschke’s farm at Hart for post-emergent herbicides for medics. The aim was to show local farmers what medics looked like and how to grow them. The site was around 50 square metres, with 5 – 6 varieties in 2 – 3 strips plus several deep ripping strips and 18 farmers attended. In 1983, the Hummocks Soil Conservation Board was formed and there was enthusiasm to do more. Support was received from the Kadina / Bute group in terms of trial plot coordination and the second year attracted 30 – 40 farmers, supported by simple catering of sausages and bread thanks to the Brinkworth Bowling Club, who are involved in our Field Day catering to this day. In these early days, promotion was through word of mouth and no funds for the land or the equipment were involved. By 1984 – 85, the Department of Agriculture was providing significant support with advertising and programs and officers such as Allan Mayfield and Barry Bull championed the day. 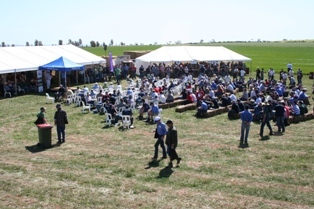 Crowds of 300 – 400 farmers came to look at wheat and barley trials that stretched over two hectares. Interest in pulses provided a real spark in the late 1980’s and the Field Day began to evolve into an event unique to the State. With PIRSA providing the seeds, harvesting and trial coordination and the farmers providing the seeding equipment, the Field Day became a showpiece for new varieties. Marquees were introduced, catering was sub-contracted and crowds of 600 – 700 farmers were common. In the early 1990’s, a sea change occurred as PIRSA (Primary Industries and Resources of South Australia) began to wind down its involvement in the site and fee-for-service was introduced across government agencies. In response, the farmers decided to privatise the operation. A Management Committee was formed, with Tom Yeatman as the inaugural chairman and seeding and preparation work were organised independently. By 1999, attendance had increased to 900 farmers, with trials being organised by former PIRSA officers such as Allan Mayfield. In 2000, the opportunity for a permanent site became available as a nearby paddock was offered for sale. The Management Committee decided to purchase the 40 hectare site but the banks refused to lend money to a committee. Eventually the Wakefield Regional Council agreed to support the committee to enable the purchase to proceed. With a permanent and independent site established, private consultants began to ramp up the operations of the Field Day as a way to provide extra value to their clients. 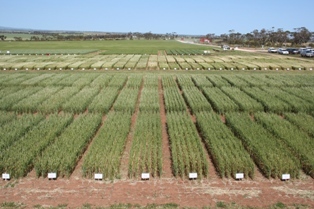 Industry funding was achieved from GRDC (Grains Research and Development Corporation) and SAGIT (South Australian Grain Industry Trust) and private sponsors were secured. By 2005, the Hart Field Days had evolved into a more diversified product with spring walks, winter walks and workshops in addition to the main event. Hart had reached their 25 year anniversary in 2007, and celebrated with a dinner recognising this important event. The Hart Field-Site Group Inc. updated their constitution in 2009 and began operating as a Board rather than a Committee and three year terms were introduced for Board Members. 2010 saw a momentous occasion acknowledged at the annual Hart ‘Getting The Crop In’ Seminar. The 40 hectare parcel of land purchased at Hart was paid off in full, and a special presentation was made to the Wakefield Regional Council to mark the event. There are no other groups of this type in Australia known to have accomplished this significant achievement.